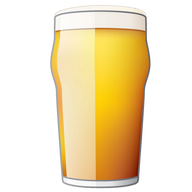 I’m pl eased to announce the upcoming release of BeerSmith 3, which has been in development for almost two years. It has been in beta test for several months now and I’m planning to release the desktop version prior to Homebrewcon (this month). The mobile version 3 for your phone or tablet will follow in late July. While I’m certain many of you have questions about release date, upgrades, and pricing this post will only take a look at some of the key features. I will follow up this weekend with a detailed feature post and announcement on upgrades, preorder, pricing and the final release date. BeerSmith 3 now supports mead, wine and cider recipe types, just as it now supports extract, all grain or partial mash beers. This means you can open a recipe, set the type to mead and start adding your honey, fruit and yeast and it will help you predict original gravity, final gravity, and even estimate yeast nutrient requirements. The program has complete style guides for mead, wine and ciders as well as a ton of new ingredients, tools and add-ons to support them. It also adds native support for honey, juice and fruit – features that carry over to beer recipe development as well for those fond of fruit beers. 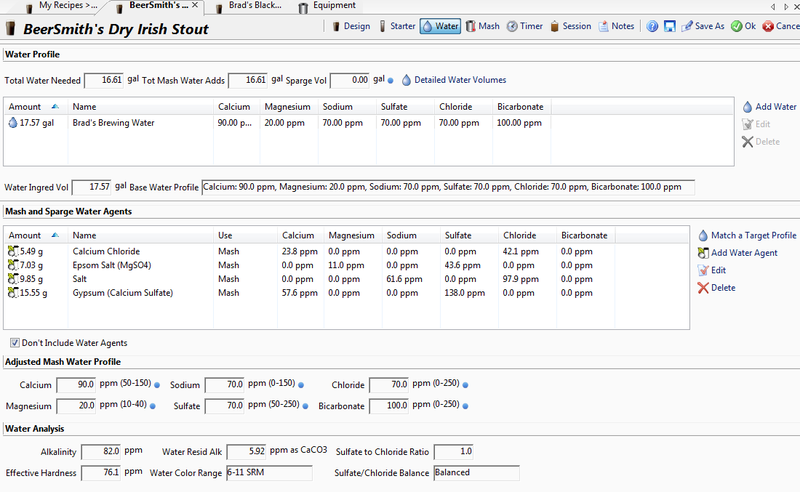 For beer brewers, the recipe builder now includes both the water profile tool and mash pH estimation fully integrated with the recipe builder. So you can add your water salts as ingredients and see what the adjusted water profile is. Match a target water profile on the new water tab and it will add the salts for both mash and sparge directly to your recipe. 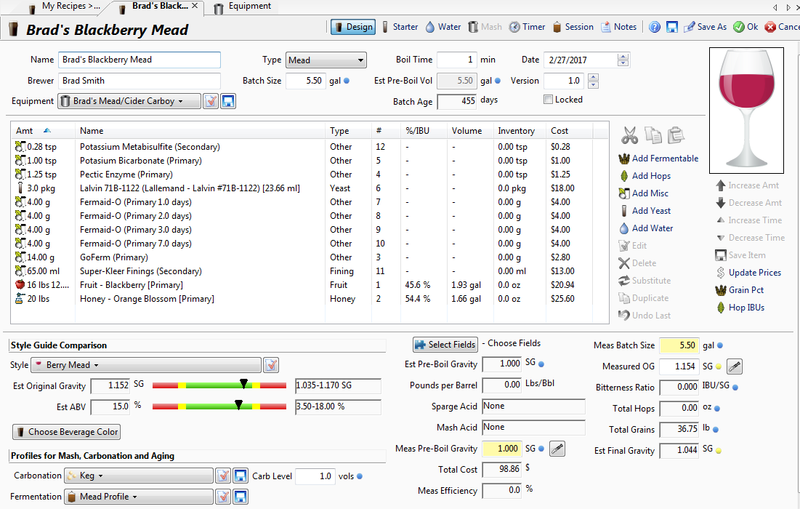 You can even “blend” base water profiles by picking different waters in your recipe builder. The mash pH estimation has also been revamped and now reflect both water salt ingredients (i.e. the adjusted water profile) and lactic, phosphoric or acid malt adjusments. It shows you both an unadjusted and adjusted mash pH based on your acid additions in the recipe, and you can even take a pH and calculate a final water adjustment. These changes make it easier than ever to adjust your mash pH up front based on the estimates, and then make a final adjustment on brew day. With the explosion in IPA brewing, I could not ignore whirlpool hops. 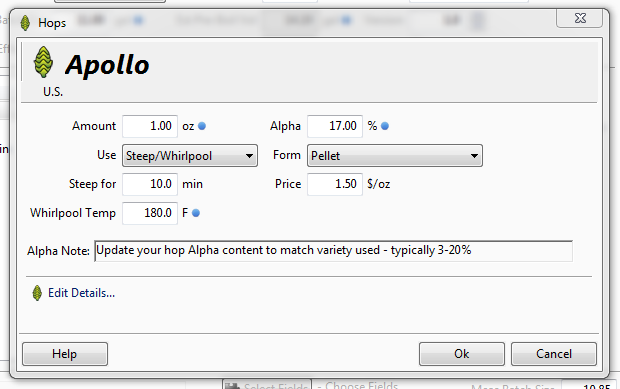 BeerSmith now has a proper model for the utilization of steeped/whirlpool hops vs temperature, and lets you specify both temperature and time for each whirlpool addition. It also has an enhanced model for carrying forward unused boil bitterness into the whirlpool enabled from the equipment profile for easy reuse. Similarly, BeerSmith 3 supports a new boil elevation setting in the equipment profile that estimates the boiling point and reduced hop utilization you will see when brewing at altitude. The difference in hop utilization can be significant if you are brewing well above sea level. For the frugal brewer, the yeast starter tab now supports two stage starters for liquid yeast which can save you a few dollars on a second batch or new pack of yeast. Instead you can create a yeast starter, ferment it, decant it and create a second starter to reach your target for yeast cells. 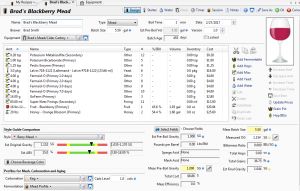 For those using dry yeast, including most mead, wine and cider makers the yeast tab now calculates dry yeast hydration for you and shows optional Goferm amounts to use on hydration. For mead makers the program calculates the mead nutrients needed for both the TONSA-2 and TiONSA nutrient schedules. While not a complete rewrite, I have abandoned the 1990’s blue in favor of a cleaner grey look and feel. The menus, ribbon bar and many of the dialogs were revised to make features more accessible and relevant to the task at hand. For example you can install add-ons right from the “add ingredient” dialogs or even create a new hop or fermentable on the fly instead of having to leave your recipe, go to the ingredients view and try to add a new hop variety or add-on. The dialogs, reports and displays are now smarter as well. The program no longer shows stuff that is not relevant to the task at hand. So if you are making an extract recipe it won’t show a ton of all grain brewing data on your session page or brewday report. Instead it will show relevant data like the total volume of extract you are adding and how much water you need for your boil. This is done throughout the program to great effect – add a new “juice” fermentable and you’ll be prompted for the brix value (or specific gravity) instead of having to enter the “find grain dry yield”. Each dialog adapts to what you are doing to make the program more approachable and easier to use. Sometimes the little things matter – like having folders to store your cloud recipes in! While the old cloud features let you store your recipes between devices,there was no way to organize them other than one long list. Now have my brew log folder, mead, wine, cider and beer folders available online so I can access data on the go. This will be available in the mobile version as well in July. Because you wanted cloud space, most of the new BeerSmith 3 license options will include cloud space. In addition you can now rate recipes within the software and there is a new “unlisted” sharing option that lets you share a link or id with a friend without having that recipe show up in the public search results. Finally the cloud connections are all encrypted and secure now (SSL/TLS 1.2), including both mobile and desktop. 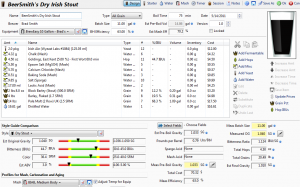 BeerSmith 3 includes a ton of new data to support beer, mead, wine and cider. Here’s just a partial list: updated hops, cryo-hops, hop extracts, honey varietals, juice for cider making, common fruit juices, fruits, dozens of new misc ingredients, new yeast varieties, the BJCP mead and cider style guide, a complete wine style guide, fruit purees, water profiles by beer style and more. The new add-on manager makes it much easier to track which add-ons you have install and which are available for each data type. BeerSmith 3 runs from a separate directory, so you can run BeerSmith 3 side by side with your existing BeerSmith 2 install. It also gives you an option to import your data and settings from BeerSmith 2 quickly on your first startup. This post only scratches the surface on the new features for beer brewers as well as mead, wine and cider makers. Need to backsweeten your mead? There’s a tool for that. Sulfite calculator for wine/mead? Sure. Refractometer popups for easier entry of gravity measurements? Check. Mash profiles for RIMS/HERMS systems – got you covered. Calculate separate sparge and mash water profiles? Absolutely. Yeast alcohol tolerance for high gravity beers/meads/wines? Yep. This weekend I will post a detailed list of features, release notes and also open the preorder for those looking to upgrade. Watch the BeerSmith blog for the latest updates. Marcelo Magnabosco from Brazil… Looking forward to the new version of BeerSmith… by my first vision, the adjustment profile of the water has improved a lot, but it is still missing an important detail, the hydration of the salts of adjustment of the water, almost never, at least here in Brazil we can acquire these salts in their anhydrous form, Epsom salt for example we only find hydrated hepta (MgSO4.7H2O), this impacts on the concentration of ions. Will Version 3 support Mac retina displays? It will run on retina but some icons are still blurry. I have a solution for this now but need a bit more time to implement it so it will be in the first update after release. 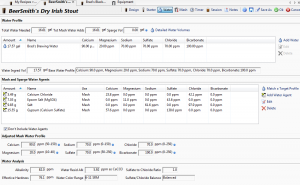 The new version does not have support for anhydrous salts at this time. I do apologize but its not in there yet. Perhaps for a future update. I do have the basic fermentation calendar in the program along with fermentation profiles you can set that are pretty well matched to many kit maker’s recommendations for primary/secondar/etc, but I do not have a notification system as you suggest. Yes there will be a page where you can get a free gold membership for a year if you purchased after 15 Oct 2017. I did not change the handling of cooling shrinkage. I will be running a sale on preorder and extend that into the early release period for those looking to upgrade. You can export to CSV but I do not have an import function. I have improved the data entry for fermentation readings quite a bit – simple things like defaulting to today’s date/time. I have translators working in Portuguese and French on the beta, but I believe others will also take on the task after launch. The desktop version should have a Portuguese version available not too long after launch. I do not have plans to translate the mobile version yet. I hope you have added more support for extract brewers whether it be hoped or un-hoped extracts. As in one of you posts you made the comment there are more extract brewers the grain brewers. I currently own licenses for both BS and BTP2. I stopped using BS because the GUI looks very dated and cluttered beyond belief. Based off the provided screenshots, this major update still hasn’t remedied those issues for me. I think I’ll stick with BTP2 for now. I hope future updates will address my issues at some point, but it likely would end up being another major update away, if at all. Will this still be an issue in Beersmith3? Ciao and tx for the awesome product! Since winemaking is often a long process compared to the typical brew day, is there a window where you can see the various tasks of the day of different active batches? Is there a way to flag or select batches to make/show them active. Hi. Please add in new version Russian language!it’s will be great! Marcelo, na verdade os cálculos do beersmith já consideram os sais hidratados (nas sua respectivas hidratações mais comuns). Eu conferi os cálculos. O software apenas não mostra a fórmula molecular completa (e correta) dos sais hidratados na aba das ferramentas de ajuste de águas. A massa de sal que ele indica para adicionar à agua já é do sal hidratado. Will the new cloud site be able to sync recipes with your local BeerSmith folders? Currently it doesn’t. If I make changes to the session data or something on my phone while brewing with a recipe in the cloud I then have to copy it down to my desktop and replace the recipe there. Translation to Portuguese / Br in the mobile version? Will the basic licence allow one desktop version and one mobile (app) version or will they be separate purchases? Will beersmith 3 link to the current beersmith app or will version 3 not connect to current mobile version. Next step is to migrate the platform to WEB. Not to leave the installation dependent on the personal computer. It would be 100% cloud! That is the plan actually! Great news on the upcoming release! Looking forward to all of the new functionality and data updates! Many thanks for making this valuable tool so affordable and for the continued updates and work!! First, a big thanks for you efforts of giving us a very good tool. It have helped me a lot in my progress as a home brewer. Really nice to see an upgrade, I hope we v2 users at least will have a discount. One thing that I have not seen anywhere in the notes is a cloud inventory, will it be part of v3? So annoying having your inventory updated at home, and then with the mobile in my hand at the store I have no access to it. I’ve seen the question asked here, but no answer as far as I can tell. Will Linux be supported in version 3? I understand this likely represents a very tiny number of users, but some of us are exclusive to Linux. Yes, I’m planning a Linux release for Ubuntu 18.04 though it will be in late July. No the cloud based inventory is not in 3.0 but I have started work on it along with a web based version of BeerSmith which will be coming next year. The cloud inventory is not in 3.0 though it is coming soon. The mobile app is still a separate purchase. While I would love to bundle them the app stores simply have no way to do it and they control the app licensing and purchase systems. We are working a desktop translation but not the mobile version yet. No the cloud folder is still separate however you will be able to create and manage folders in the cloud now so you could (for example) store your entire brew log folder online as I do. Thanks – I have not done the aqueous versions of salts yet. Still on my “to do” list. 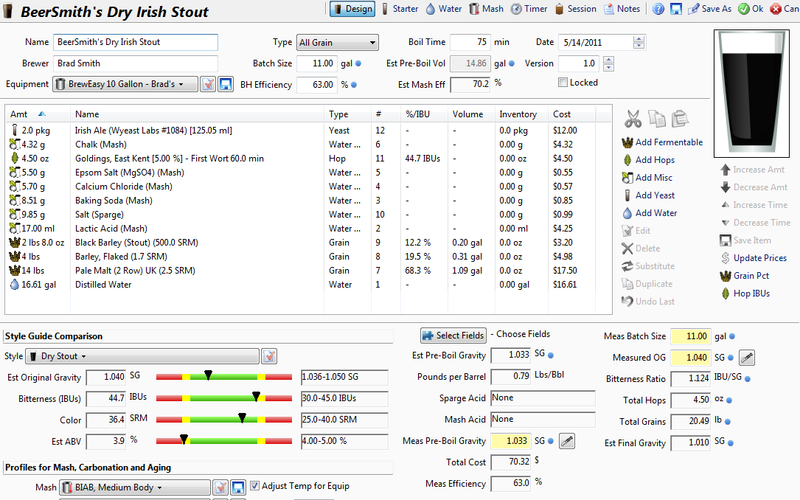 I’m not aware of a Russian version yet but the tools to translate BeerSmith are available on the forum. There is a calendar and you have some activities tied to the fermentation stages. In addition you can use the “notes” feature under View->Notes if you want to add specific items to the calendar that are not specifically in the recipe. I’m planning a Ubuntu release for late July. I’m not sure how well that translates to Mint however. Thanks for the feedback – the activations can be managed from your account so you can deactivate old devices in a matter of a minute or two when needed. Yes there is now a “use in” field for fermentables so you can manage these items much better. No I do not have support for Chromebook at this time unless yours happens to run Android Apps from the play store. Unless you purchased after last October you will need to purchase a new license. There is a cooling ramp function for boil hops to support no-chill brewers. Individual whirlpool additions are calculated based on the time/temp you provide before chilling. Actually it is tied to a new field in the yeast profile. Each yeast has an “alcohol” tolerance field which I did my best to populate for the top yeasts like Wyeast and White labs based on their own data. For beer yeasts that I had no data on I used 10% as an average value. If you change the tolerance field in the yeast it will go much higher, but a lot of beer yeasts do not handle high alcohol well in reality and may stop fermenting before you get to those values. Thanks for update, but no retina display support too, what a pity! Can some one tell me with about the first wort addition box option and how it applies to the Grainfather. Ok so if you put ur hops in just before you sparge do you count the boil/steep from then? as in 40 mins (roughly the time to do sparge ). I thought the idea of first worting was to put hops in when wort was at its coldest and so releasing the oils in non boiling wort and not so the bitterness If you put in the hops after you sparge as the grainfather is heating when it is in the 90″s do you put 10mins into the boil steep box? big difference in bitterness values if put in before sparge and afterwards. Is there a way to get a date column in the cloud folder for the recipes? There is a date column in the local folder. Please consider adding a certificate to your site and make it https, it’s not that hard using Lets Encrypt free ssl certs. Prety minor thing, I know but it’ll look better on browsers. Next post: BeerSmith 3 – Pricing and Preorder Discount Open Now!